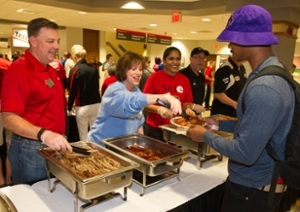 Hundreds of Southern Illinois University Edwardsville students enjoyed Finals Late Night Breakfast on Sunday. SIUE Interim Chancellor Stephen Hansen and approximately 30 other administrators and staff served breakfast to more than 650 students. The students enjoyed a menu of batter sticks, scrambled eggs, bacon, sausage links, hash browns, pastries, fruit, juice and water. Morris University Center, Kimmel Student Involvement Center and University Housing at SIUE have sponsored the breakfast for more than three years to help refuel students during finals week. 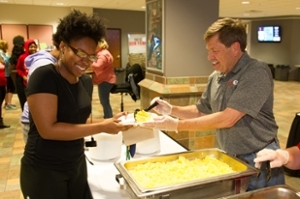 Dominique Henderson, a freshman social work major, starts her breakfast out with eggs served by SIUE Interim Chancellor Stephen Hansen. 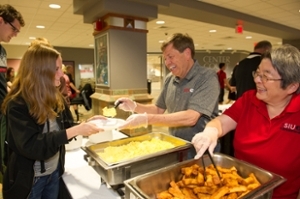 SIUE Interim Chancellor Stephen Hansen and Emerita Associate Professor Julie Hansen eagerly dish up breakfast for Cori Compton, a sophomore with an undeclared major. (L-R) John Navin, dean of the School of Business, Laura Bernaix, dean of the School of Nursing, Bethel Buerk, assistant professor in the School of Dental Medicine, and Gregory Budzban, dean of the College of Arts and Sciences, serve Vahid Alizadeh, graduate student majoring in mechanical engineering.